There's this old picture that sits on my parents' mantel. The picture is a bit wrinkled from many moves and the right corner has a small jagged tear. But there's no mistaking that it's a picture of four-year-old me, gleefully reaching for another piece of cake with one hand while shoving a giant piece of cake in my mouth with the other. I'm wearing a frilly pink dress with a pink bow headband perched precariously on my head. And I have the biggest grin ever on my face. It's clear from that picture alone that I have a deep love of birthdays (and cake)! My family moved a fair bit when I was younger. But regardless of where we were, we celebrated birthdays in style. Granted "in style" meant something different thirty years ago, and in my case, it most often meant grocery store cakes (which my immigrant parents deemed fancier and more special than homemade ones), balloons, and family. Not helium balloons mind you, plain ol' "we blew these up with our own blood, sweat, and air" balloons. I've gone to some crazy birthday parties for kids over the years with everything from fully laden candy buffets to personalized cookies bearing the likeness of the birthday child, but to this day, I'm convinced a bunch of non-helium balloons and a simple yellow cake with chocolate frosting and sprinkles are really all you need to celebrate. I'm not sure how my parents conveyed that sentiment but I promised myself I'd do the same for my family. For the hubster's first birthday after we got married, I proudly proclaimed that I'd make a homemade banana cake with cream cheese frosting. I envisioned carrying it proudly to his giant family gathering. Except well, when you melt butter in the microwave instead of letting it come to room temperature, you get a crepe instead of a cake. You heard it here first, people. To this day, that "cake" haunts me. When Little Man was born, I figured it was finally time to fix the grand cake debacle. The first year, I planned on making a giant cupcake cake only to completely underestimate the batter needed. We rolled with a lopsided not-so-giant cupcake. And sleep deprived me thought it the best, most ridiculous looking cake ever. Until this year when Little Man turned two. This cake was going to be, legen, wait-for-it... well, you get the point. It was banana cake with cream cheese frosting redemption time! I envisioned a three layer cake, standing proudly, all decked out in homemade frosting. Oh, and sprinkles of course, because it just ain't birthday cake without sprinkles. So at midnight the night before Little Man's birthday, I busted out my room temperature butter (fool me once...) and cake supplies and got to baking. I couldn't find my two small round cake pans but figured it'd be no big deal with one larger round pan. Until the cake came out much wider and not nearly as tall as I'd envisioned. I guess the bigger pan mattered after all. And then, I did what any self respecting mom would do. Slathered that big, flat cake in homemade (delicious) cream cheese frosting, dumped on a boatload of sprinkles and called it a raging success. 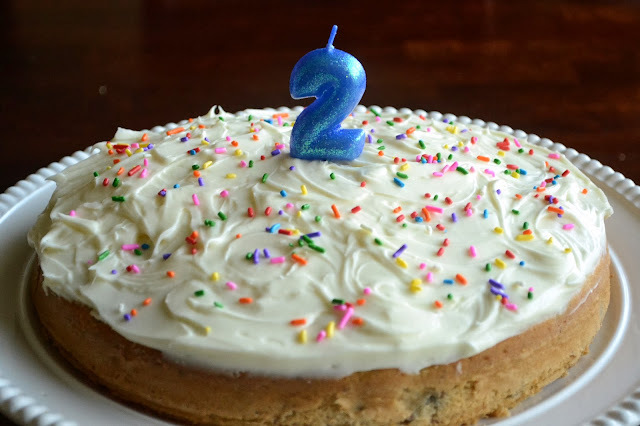 The next day, we presented the cake to Little Man and from the elated look on his face, I knew he'd never care if his birthday cake was too short or too big or too flat so long as it was made with love (and frosting, obviously). So we sang Happy Birthday fifteen times like he ordered, and we clapped like we'd never clapped before. And we ate cake. With sprinkles, of course. Sprinkle sprinkles or chopped walnuts top of the frosting, if desired. Sprinkles make ALL the difference!! Happy 2nd Birthday Little Man! A very Happy Birthday to your little man! Home made cakes are so much better than store bought IMHO. My kids look forward to their BDay cake all year. Can't believe he's 2 already!!! 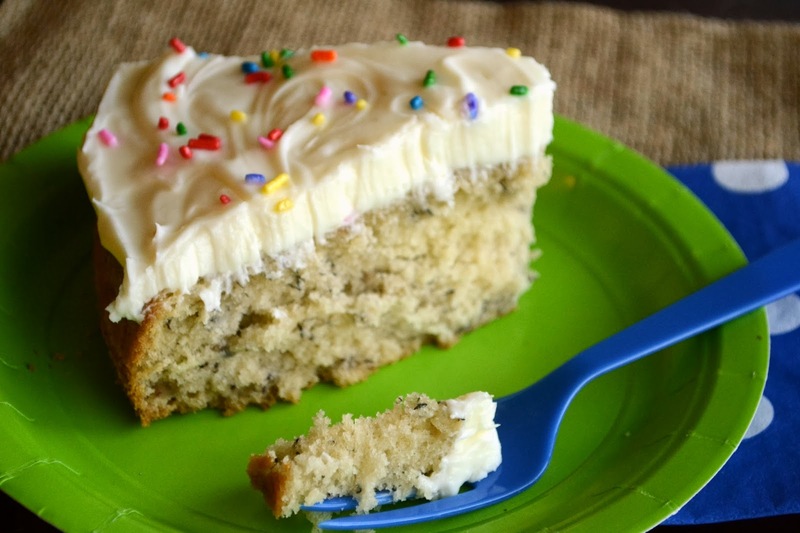 I grew up eating banana cake with cream cheese frosting too. I loved it! Happy Birthday to your little guy. I love this homemade-with-love cake. Kids don't care that you had visions of grandeur in your head, only that you let them know how special they are. My mom always made me a yellow cake (from the box) with canned chocolate frosting and I thought it was the best thing ever, lol. Plus I've been to some over-the-top parties and usually they end with the birthday boy or girl having a meltdown from overload. He he. So many crazy kids birthdays these days....I agree that all you need are some balloons and a VERY good cake. And I know for sure that you are just being humble, that every cake you make is perfect and delicious. This is such a sweet post....your little man is one lucky guy. A Happy Birthday to him! Happy Birthday to your little man! Can't believe he is two already. This cake looks very tasty and sounds like fun was had by all! Happy Saturday!! Happy BIRTHDAY to little one!! What a lovely memory of you celebrating birthdays, very special. I love banana cakes, and it does look mighty good. Not too fond of all the over done birthday hullabaloos myself - you are quite right. Keeping it simple and homemade is all the more special. Oh man...that was awesome. I'm all over smiles and warm fuzzies. My birthdays were exactly the same; a home made cake, blown-up balloons and family. It was awesome. I love this cake and love that the little man enjoyed it so much. That's how it should be. Happy birthday to him!